The Thomas and Elsie Deeley Foundation is a not-for-profit private foundation that has established annual scholarships at Sacred Heart High School in Waterbury, Connecticut. 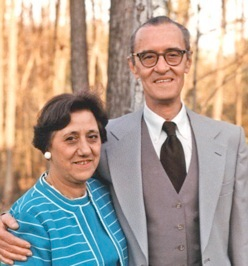 The Thomas and Elsie Deeley Foundation was established by their two children, Ted and Donna, in 1996 to memorialize the “helping hand” approach engendered by their parents. It is designated as a tax exempt 501(c)(3) corporation by the Internal Revenue Service. The Deeley Foundation offers assistance to eligible high school seniors who qualify for admission to a college or university but lack the financial resources to attend. These scholarships are based on the belief that personal involvement with recipients creates a tangible bond between the student and the donor. Hopefully this bond will encourage our scholarship recipients to offer personal support to someone else after they graduate by “passing it along” – in the form of mentoring and/or financial assistance. The scholarship was initially restricted to just those Sacred Heart seniors applying to Fairfield University because Fairfield had agreed to a matching arrangement. In 2002, the Deeley Foundation, in an effort to provide more students an educational opportunity, expanded the scholarship to include students applying to any four-year college or university. Quinnipiac University and the Deeley Foundation created a matching partnership in 2003 similar to the Fairfield University agreement. In 2004 the Deeley Foundation entered into a matching partnership with Southern Connecticut State University Foundation. In 2014, in response to rising college costs, the Deeley Foundation broadened its scope once again to include students applying to two-year colleges. In 2015 the partnerships with Fairfield University and Quinnipiac University were expanded to offer FULL TUITION scholarships to students who meet certain financial need criteria. Then, in 2016, the Deeley Foundation instituted a scholarship partnership with Boston College, and in 2017 the FULL TUITION partnerships were extended to include the University of Bridgeport, Sacred Heart University, and the University of Saint Joseph. Also in 2017, the Deeley Foundation and the Central Connecticut State University Foundation and Western Connecticut State University Foundation entered into matching partnerships similar to the existing arrangement with the Southern Connecticut State University Foundation. Later in 2018, a matching partnership agreement was formed with the Eastern Connecticut State University Foundation. More recently the partnership with Fairfield University was modified to provide support for 100% of a student’s demonstrated financial need, a FULL NEED scholarship. In late October of 2108, a new partnership was formed with Stonehill College and in early November with Albertus Magnus College. Both these new additions also agreed to provide support for 100% of a student’s demonstrated financial need or a FULL NEED scholarship. Since its inception in 1996, The Thomas and Elsie Deeley Foundation has funded over $1,900,000 worth of scholarships for Sacred Heart High School students. These scholarship recipients have a 95% college graduation rate. This scholarship is only available to Sacred Heart High School seniors, regardless of race, gender, or religious belief. We strongly encourage every senior at Sacred Heart to apply for the scholarship, regardless of whether he/she plans to attend a two-year or a four-year institution. No members of the Deeley family or anyone with business relationships with The Thomas and Elsie Deeley Foundation or the family owned or operated businesses are eligible for this award. Applicants must submit a completed scholarship application to be eligible for consideration. After an initial screening, representatives of the Deeley Foundation interview finalists, and awards are made to the student(s) selected for the scholarship. The scholarship recipients are usually notified about three to four weeks after the interviews are completed. The Deeley Foundation has been successful in creating scholarship partnerships with twelve universities in the Connecticut area; four public universities and eight private colleges and universities. These partnerships allow the Deeley Foundation to stretch our funding dollars and award more money and scholarships to students. There is no need for a scholarship applicant to apply for a specific type of scholarship. All applicants to colleges partnering with the Deeley Foundation are automatically considered for all scholarship programs that relate to the college(s) to which they have submitted applications. These partnerships vary from school to school and have different criteria. Specific admission information for each of our partners can be found in the LINKS section at the bottom of this page. The following chart provides a distribution of where our scholarship recipients have attended colleges and universities. In 2018 the partnership between Fairfield University and the Deeley Foundation was modified to expand what was once a FULL TUITION scholarship for students with family incomes of $65,000 or less to a FULL NEED scholarship; meeting 100% of a student’s Demonstrated Financial Need (DFN) regardless of their family income. Shortly after the Fairfield University partnership was modified, Stonehill College and Albertus Magnus College became new scholarship partners with The Thomas and Elsie Deeley Foundation and are also offering a FULL NEED scholarship. These schools have agreed to fund 100% of a student’s Demonstrated Financial Need up to the total direct Cost of Attendance (COA). Most colleges only cover a portion of this need. The Deeley Foundation contributes up to $15,000 towards this scholarship and the colleges provide the balance of the student’s DFN as a merit scholarship and need based institutional aid. In addition to this scholarship, recipients will also continue to be eligible for any Federal Pell Grants and/or Federal Work Study programs for which they may qualify. The total aid provided will not exceed the Cost of Attendance. A FULL TUITION scholarship was instituted with the University of Bridgeport and the University of St. Joseph effective in 2017. The Deeley Foundation contributes $15,000 towards these scholarships, and the University of Bridgeport and the University of Saint Joseph provide the balance of the tuition. This scholarship is currently valued at $126,520 for the University of Bridgeport, and $145,092 for the University of Saint Joseph Only those candidates who are both accepted by the University of Bridgeport and/or the University of Saint Joseph and have family incomes of $65,000 or less may receive these scholarships. Students receiving a FULL TUITION scholarship remain eligible for additional financial aid (e.g., work study, grants, loans, etc.) to assist with the cost of room and board and fees. Recipients are required to maintain a G.P.A. of 2.8 to remain eligible for these scholarships. Beginning in 2015, Quinnipiac University and the Deeley Foundation modified their matching partnership to create a FULL TUITION scholarship, for students who are Pell Grant Eligible. The Deeley Foundation contributes $15,000 towards this scholarship, and Quinnipiac University provides the balance of the tuition, which is currently equal to $27,270. This scholarship is currently valued at $169,080 for four years. Only those candidates who are accepted by Quinnipiac University and are Pell Grant Eligible may receive the scholarship. The requirements for this FULL TUITION scholarship are a combination of those from Fairfield University/ University of Bridgeport/University of Saint Joseph and those at Quinnipiac University. Sacred Heart University and the Deeley Foundation established a partnership scholarship effective in 2018, a FULL TUITION scholarship for students who have a family income of $65,000 or less AND are Pell Grant Eligible. The Deeley Foundation contributes $15,000 towards this scholarship, and Sacred Heart University provides the balance of the tuition, which is currently equal to $39,570. This scholarship is currently valued at $158,280 for four years. Only those candidates who are accepted by Sacred Heart University, have family incomes of $65,000 or less, and are Pell Grant Eligible may receive the scholarship. These scholarships are valued at up to $48,000 for four years. The Foundations associated with Southern Connecticut State University and Central Connecticut State University have agreed to match the Deeley Foundation’s scholarship awards. The Thomas and Elsie Deeley Foundation has agreed to award up to 50% of the actual cost for tuition and fees, and the universities have agreed to match this amount. This matching arrangement currently brings the total award to the lesser of the actual tuition and fees or $12,000 per year up to $48,000 over a four-year period. There is no specific financial need requirement for a student to receive these scholarships. The Deeley Foundation selects the students it feels are deserving of a scholarship, and the universities agree to match whatever financial award the Deeley Foundation makes. As part of our agreement with these two universities, The Thomas and Elsie Deeley Foundation may award up to a total of $18,000 for any academic year, and the schools have agreed to match that same amount for a total of $36,000 in scholarships at each school during any single academic year. These scholarships could consist of one student each year over a period of four years (i.e., a freshman, a sophomore, a junior, and a senior), or could be used to fund multiple scholarships for a specific year (e.g., four freshman scholarships), or could also be used to fund several partial scholarships. These scholarships are administered through the Southern Connecticut State University Foundation and the Central Connecticut State University Foundation respectively. The Deeley Foundation sends its portion to the designated foundation at each school; the school’s foundation then matches this amount and forwards the combined scholarship to the Financial Aid Office at their respective universities. Recipients are required to maintain a G.P.A. of 2.5 to remain eligible for these scholarships. These scholarships are valued at up to $48,000 for four years. The Foundation associated with Eastern Connecticut State University has agreed to match the Deeley Foundation’s scholarship awards. The Thomas and Elsie Deeley Foundation has agreed to award up to 50% of the actual cost for tuition and fees, and the university has agreed to match this amount. This matching arrangement currently brings the total award to the lesser of the actual tuition and fees or $12,000 per year up to $48,000 over a four-year period. There is no specific financial need requirement for a student to receive these scholarships. The Deeley Foundation selects the students it feels are deserving of a scholarship, and the university agrees to match whatever financial award the Deeley Foundation makes. As part of our agreement with the University, The Thomas and Elsie Deeley Foundation may award up to a total of $18,000 for any academic year, and the school has agreed to match that same amount for a total of $36,000 in scholarships during any single academic year. These scholarships could consist of one student each year over a period of four years (i.e., a freshman, a sophomore, a junior, and a senior), or could be used to fund multiple scholarships for a specific year (e.g., four freshman scholarships), or could also be used to fund several partial scholarships. These scholarships are administered through the Eastern Connecticut State University Foundation. The Deeley Foundation sends its portion to the foundation; the school’s foundation then matches this amount and forwards the combined scholarship to the Financial Aid Office. Recipients are required to maintain a G.P.A. of 2.75 to remain eligible for these scholarships. This scholarship is valued at up to $40,000 for four years. The Foundation associated with Western Connecticut State University (WCSU) has agreed to match the Deeley Foundation’s scholarship awards up to $5,000 for a total of $10,000 in any academic year. This matching partnership currently brings the total scholarship award to the lesser of the actual tuition and fees or $10,000 per year, up to $40,000 over a four-year period. There is no specific financial need requirement for a student to receive this scholarship. The Deeley Foundation selects the student it feels is deserving of a scholarship, and the Western Connecticut State University Foundation agrees to match whatever financial award the Deeley Foundation makes. These scholarships are administered through the Western Connecticut State University Foundation. The Deeley Foundation sends its portion to the foundation; the school’s foundation then matches this amount and forwards the combined scholarship to the Financial Aid Office. Recipients are required to maintain a G.P.A. of 2.5 to remain eligible for these scholarships. Boston College meets 100% of a student’s financial needs, but not necessarily the full cost of attendance. Boston College and The Thomas and Elsie Deeley Foundation have entered into a unique agreement to provide special assistance to students from Scared Heart High School. This agreement allows the Deeley Foundation to match up to $15,000 of the self-help (non-scholarship financial aid) awards made by Boston College and allows the student to retain the full amount of the self-help awarded by Boston College. These scholarships have a value of up to $60,000 for four years. See the News and Updates section of our website for details of this agreement. Our scholarship recipients are free to attend the college or university of their choice. For schools other than those who have partnerships with The Thomas and Elsie Deeley Foundation, the scholarships are valued at up to $48,000 for four years. The Deeley Foundation will make an award equal to the actual tuition costs or $12,000 per year, whichever is less. There is no specific financial need requirement to receive one of these scholarships from the Deeley Foundation. In addition to the scholarships described above, the Deeley Foundation sometimes makes partial awards to deserving students. These awards range from $2,000 to $8,000 per academic year and have a value of $8,000 to $32,000 for four years. The graph below shows the dollar value of all the scholarship awards made by The Thomas and Elsie Deeley Foundation and the colleges/universities to which the awards were made (click on the chart to view an enlarged version). We are seeking those individuals who we think will “make a difference” in the future. A recipient can be a student who demonstrates a special passion for a particular field of interest, has a unique combination of academic and social skills or has positively impacted the lives of other students. The scholarship award is good for four years, provided the recipient remains in good academic standing, is a full-time student (a minimum of 12 credit hours per semester), and continues to meet the financial need requirements. “Good academic standing” requires the student to maintain a minimum of a cumulative 2.5 G.P.A. (2.8 G.P.A., in the case of the FULL TUITION scholarships at Fairfield University, Quinnipiac University and the University of Bridgeport and also for scholarships to Boston College) at the end of each academic year. If a recipient fails to remain in good academic standing or becomes a part-time student, then the scholarship can be terminated. The Deeley Foundation forwards its portion of the scholarship to the college or university (or, in some cases, to the school’s foundation), and the school directly administers the scholarship by crediting the amount of the scholarship to the recipient’s invoice for the academic semester. If a student elects to study abroad on a university sponsored program of studies, then the amount of the scholarship will be provided to the recipient to be applied towards tuition, travel, housing, and meals. Since recipients submit their grades to The Thomas and Elsie Deeley Foundation at the end of every semester, there is on-going communication between recipients and the Deeley Foundation throughout their four years. When requested by a scholarship recipient, this can take the form of suggesting majors, helping with course selections, or finding sources for additional academic help. We are very proud of our voluntary mentoring program. When practical, this program matches new scholarship recipients with former recipients. These past recipients are engaged in a wide range of careers and activities, and when appropriate, we have called upon this unique network to offer mentoring and guidance to current scholarship students who are seeking majors or careers in similar fields or attending the same college or university. We’ve also helped scholarship students who are about to graduate in preparing their resumes, suggesting possible job opportunities, providing references, writing letters of recommendation, and providing job interviewing tips and techniques. For scholarship recipients who are already in the workplace, we’ve offered advice ranging from job and career changes to help starting their own businesses. In most cases we remain in contact with recipients well after they graduate. Look on the Updates On Past Scholarship Recipients page of our website to see what some of our past recipients are doing. More specific details about The Thomas and Elsie Deeley Foundation, applying for the scholarship, and the requirements for scholarship programs at various schools can be found by visiting the section of our website called Frequently Asked Questions.